The Bradford pear tree is commonly known as the Callery pear (Pyrus calleryana) and is widely grown as an ornamental tree in the United States. The tree can attain a height of 40 to 50 feet. 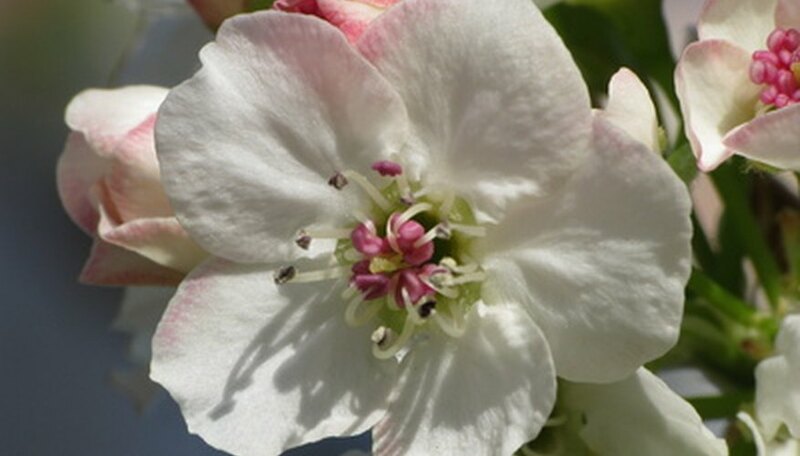 There are numerous cultivar species available; a few produced in recent years are non-sterile and have invaded areas of the eastern United States' natural woodland settings. Each spring the Bradford pear produces an abundant show of white flowers, each measuring 1 inch across and blossoming in large clusters of 12 or more. Blossoms are produced before the foliage emerges, but the foliage soon follows the flowers for a showy combination of white and green. The pollen often irritates people with allergies. The flowers have very little fragrance, but the odor they do have is often described as unpleasant. Shortly after the flowers are produced, the fruit of the Bradford tree begins to form. The original Bradford tree fruits were sterile, but recent cultivars have been bred to offer wind resistance and prevent the delicate wood from splitting. The cultivars that have been produced offer hardiness but are also non-sterile. Fruits measures only 1 inch in diameter, are olive-brown in color and are inedible. They tend to be messy as they drop from the tree; mammals and birds do not readily eat them. The Bradford pear offers a long show of autumn colors each season. The leaves slowly turn yellow, orange, red and purple. The leaves persist on the tree long after other trees foliage has fallen which makes a lovely early winter display. The trees offer wonderful street appeal and are tolerant of a wide variety of soil conditions. The Bradford pear tree is fast growing and can thrive in polluted areas. The tree prefers to be planted in full sun with well-drained soil. Once established, it is very hardy and drought resistant. The tree can easily be transplanted at any age. Propagation is obtained from tip cuttings that are grafted onto seedlings. It is advised that every 15 years, the Bradford tree be removed and a new specimen planted in its place. As the tree ages, it becomes brittle and major branches begin to break away. The tree can live from 20 to 30 years before inevitable death, but it begins to look scraggly and unkempt if not removed earlier.